One of the most common problems of this era is that we are increasingly losing our ability to concentrate on one task. With all the distractions of the modern age, we often find it difficult to complete simple tasks without getting sidetracked. Being productive at work can be even more of a struggle – staying on task for extended periods of time. We will show you some of the best apps for staying focused on your tasks, and outline the techniques that they utilize to help you. Many of the apps in this list are built around a simple timer. Some are more complex, providing an interactive way to manage your time and get rewarded for good behavior. Which app you choose depends on how fancy you want the app to be. It also depends on how skilled you are at self-management. Do you need extra help with staying focused? Would a rewards system be helpful to you or would they be more of a distraction? We will present you with a variety of options, but ultimately it will be up to you to decide what will be most helpful. We recommend that you try a few to determine what you are looking for. Keep in mind that the apps we have selected mainly fit into archetypes of a wide variety of apps, so if you are not satisfied, then hopefully you will be able to discer what you want so that you can look for an app that fits your specific needs. One of the more common techniques that people use to increase their productivity is called the Pomodoro technique. This technique works by splitting up your time into sessions called, well: ‘Pomodoro sessions’. Each session lasts 25 minutes after which you are supposed to take a five minute break. In addition, after a series of Pomodoro sessions, usually 4, you are supposed to take a longer 15 minute break. These breaks are meant to ensure that you do not get burned out too quickly. Using Pomodoro sessions is a good way to introduce a structured schedule to your work day. And luckily, there are a bunch of apps that can really help you to implement the Pomodoro technique into your lifestyle. Pomodoro Timer keeps things very simple. It may not be the prettiest app on the market, but it has everything you need to be successful. You can adjust the length of each part of your Pomodoro sessions, and view a statistics page which shows you how many sessions you have completed and more. There may not be any of the bells and whistles of some of the other apps in this list, but it gets the job done. Although it comes with a banner ad at the bottom of the screen, it is free without in-app purchases. You have worked hard, it is time to take a longer break. Lunch? Red Timer is very similar to 'Pomodoro Timer'. It is just as simple – and free – allowing you to adjust the settings for the Pomodoro sessions and nothing else. There isn't even a statistics page, but that may be okay if you do not care about tracking your sessions. If you are using exclusively Apple devices, and want something that will sync between your Mac and your iOS devices, then look no further than BeFocused. It has everything you need for a productive lifestyle including a To-Do list and customizable Pomodoro timer. However, the full experience comes at a cost. If you want to sync between iOS and macOS, the app's main selling point, then you will need to purchase the Pro version on both iOS and macOS separately. On iOS, the Pro version runs for $1.99, and the macOS version comes in at $4.99, so it’s a hefty price for the full functionality, but if it’s what you are looking for, then it may be worth the cost. Like we said in the introduction, these apps are merely good representations of apps using Pomodoro technique for staying on task. There are many other apps that ultimately do the same things with small differences in style and functionality. Thanks to the open system of Android, we have a lot of options for blocking apps that are much more thorough than can be easily achieved on iOS. With this app, you can set up 'Blocks' with specified activation times, or you can activate one for a set amount of time whenever you please. Once you activate a Block, you will be unable to enter the specified apps. You will know that you have been blocked when you try to enter a restricted app and a popup appears with a clever quote. Oh, and the only way to unblock your apps while they are being blocked is to reboot your device or uninstall the app. And there is an option to prevent uninstallation by giving the app system administrator privileges: Proceed with caution! While it is one of the better apps in the app blocker category, it does come with a paywall which can be hit very quickly. You can only have three Blocks set up at any given time, so you will need to either delete them on a regular basis, or upgrade to unlock infinite Blocks. And if you want to block more than 6 apps at one time, you will need to upgrade. One of the features that sets this app apart from the pack, is the inclusion of home screen widgets, but to access those you will need to pay up. Luckily, the app offers a range of payment options ranging from $2.99 to $8.99; and don’t worry, all of them get rid of the ads and unlock the full feature set. If you are okay with sacrificing some of the niceties of ‘Block Apps’, but want to be free from any kind of paywall, then AppDetox may be a better choice for you. The setup process is simple. Select the apps you want to detox from, choose the conditions under which the apps will be blocked, then hit Create. The app is split into three tabs: App usage, Rules, and Rule Breaks. You may use the first page to track which apps you easily get distracted by. The second will display Rules that are currently in use – you can delete them by tapping on a Rule, tapping the menu button in the upper right hand corner, and selecting Delete. Rule Breaks displays all the times you violated the rules and tried to enter an app. And when you try to enter an app while it is blocked, be prepared for some sassy toast notifications. It isn’t perfect though. The rules are not neatly grouped into Blocks, so starting a routine set of rules takes a bit longer. And sometimes you may be able to enter a blocked app if you had recently tried to open it. It can block your apps for a specified amount of time, or you can set specific times during the day, a number of launches, a specified usage time, activity based, or the most extreme option: Forever. Can we make it for 10 minutes? With all the restrictions of iOS, the ability to block apps is not exactly endorsed by Apple. But Flipd is good by itself and even offers a workaround for Apple’s walls. Upon entering the app, it will become apparent that this is aimed at students, but really, it can be used for anything. While it has presets for Study, Work, and Sleep, you can only set the timer for 30 minutes without paying for a subscription. Purchasing a subscription will unlock the full range of the timer, let you join premium groups with friends, allow the creation of multiple Flipd schedules, and give you access to a statistics page to keep track of your Flipd history. 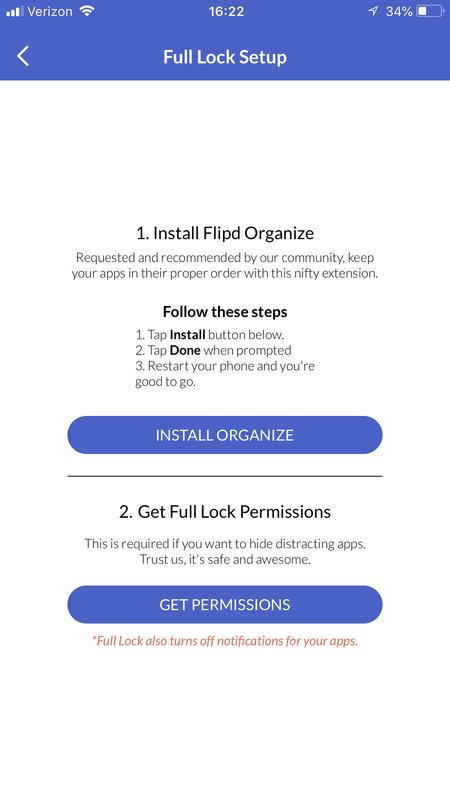 By default, Flipd does not let you truly block apps – The most it will let you do is set a timer which self-destructs if you leave the app for too long. But if you want to truly block the apps, then there is a way. Disclaimer: this is extremely risky territory not endorsed by Apple; if things do not work out, you may have to reset your device which could result in lost data; proceed with caution. Go into the Settings page and select 'Get Full Lock Permissions'. 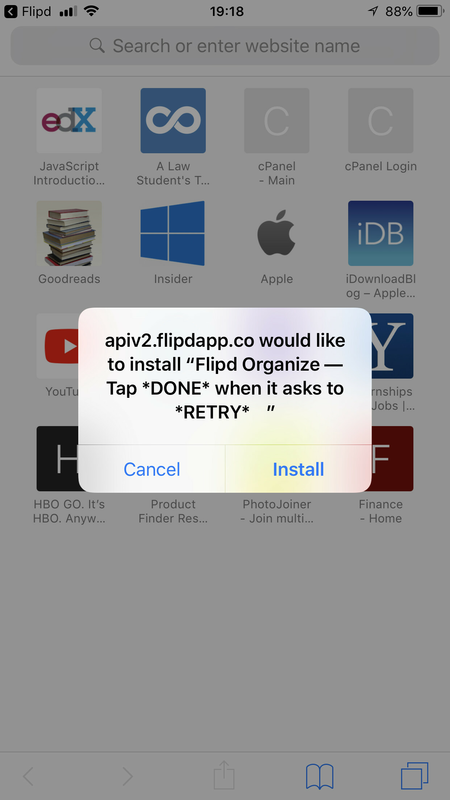 Tap 'Install Organize' to download the app 'Flipd Organizer' from the developer. It will direct you to your web browser and prompt you to install. Once installed, you will need to install a separate profile onto your phone. Tap 'Get Permissions' on the previous screen. Hit 'Allow' when you are prompted to open Settings, then press Install on the next page. Reboot your phone and you should be ready to go. When the apps are being blocked, their icons will not appear on your home screen which, in a way, is even more intense than the previously listed Android solutions. 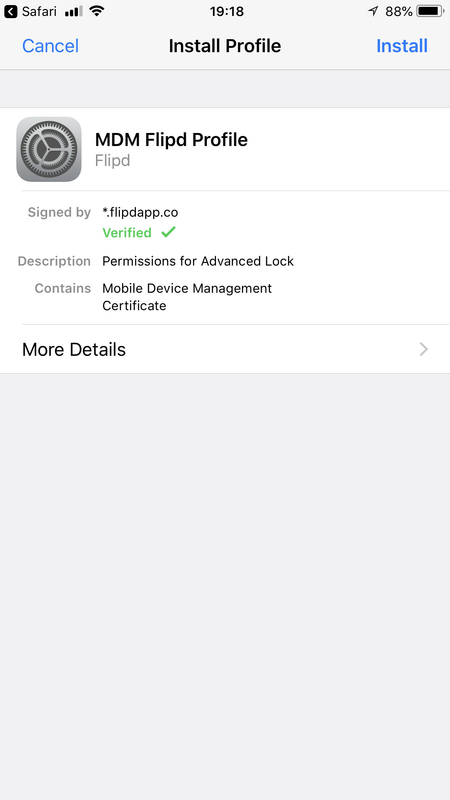 You have probably noticed that we have only been talking about Flipd on iOS. As for using it on Android, there more powerful options available that are not so restrictive in terms of the paywall. But if you are okay with the time restriction of 30 minutes, then using Flipd might be ideal. Full Lock is definitely the most thorough blocking solution we could find on either platform. And on Android, engaging Full Lock is as simple as giving Flipd permission for Usage Data Access. When your Android device is in Full Lock mode, you only have access to the most basic apps, such as the Phone and Calculator. The only way out while still in Full Lock mode is to reboot your device. These apps add a unique element to staying on task. Apps like Forest and Flora can turn a relatively boring thing like time management into an enjoyable game. While a big part of staying on task is having good time-management skills, another aspect is keeping track of your tasks. There are a ton of great to-do apps out there from Wunderlist to Evernote to Apple Reminders, but Habitica may be the most unique approach we've seen. Are ads worth it to get rid of the dead tree? Being productive with Forest makes a real life difference – that's a lot of trees! Forest is one of the more fun apps on this list. Its premise is quite simple. You launch the app, set a timer, then work while your tree grows. If you get distracted by your phone, the tree dies. Every time you finish a session, the tree (including dead trees) will appear in your personal forest. The forest is a visual way to keep track of all your sessions and you can tap on individual trees to see what you did to grow it. Finishing a session and earning achievements will give you coins which you can use in the in-app store. With them, you can purchase new types of trees, shrubs, and flowers to grow in your forest. You acn also use coins, or watch an ad, to remove dead trees from your forest. The idea is that, if you are truly dedicated to maintaining a healthy forest, you will avoid adding dead trees or will pay the price to remove them. On Android, Forest is free but it comes with a lot of limitations. Paying the $1.99 upgrade fee unlocks a lot of things including: Syncing between devices, competing with other Forest users, the Achievement system, managing your own tags, and viewing your Big Forest – which allows you to browse your daily, weekly, monthly, and yearly forest. Also disabled in the free version is the heartwarming feature that allows you to spend your accumulated coins on planting a real tree in Africa. Being focused really does help to save the planet…Wow! Oh, and there are ads. On iOS, there is no free version; the app costs $1.99, but all the features are included. Proceeds go to growing real trees – a terra-ific cause! Flora is similar to Forest, but it is only available on iOS and, unlike Forest, it is free to download. While the concept is similar, Flora allows you to raise the stakes by putting real money down if your tree dies. The proceeds from your dead trees (read: unfinished tasks) goes to planting real trees in Africa. So far, users of Flora have helped to plant 7,431 trees at the time of writing this article. If you have ever wished you could live your life like a videogame (or if you already view life this way), then Habitica may be just the app you have been looking for. Starting up Habitica will bring you through the process of creating your avatar and learning the various features of the app, and get ready for a learning curve because there are a lot of things to check out. Habitica organizes the app into a few different sections depending on different types of tasks. The first page lets you add habits that you are either trying to reinforce or break. Tapping on the + or - icons on either end of the habit entry will either give your avatar experience points and additional health or, conversely, will deduct health points from your avatar. This one really tests your motivation as you will have to hold yourself accountable. The objective is to keep your avatar healthy, so if you find yourself not caring about its wellbeing, then this might not be the right app for you. The next page is called Dailies, and this is where you store tasks that will reoccur with a specific frequency (daily, weekly, etc.). Checking off the task for the day will grant your avatar experience and coins. Not checking off your Dailies will result in your avatar taking damage. On the third page, you can set To-Dos which do not reoccur and also gives you experience and coins when completed. With your accumulated coins, you can visit the Rewards tab and purchase new equipment and power-ups, like health potions for healing your avatar if you are not completing dailies, or are not properly managing your habits. But if you want to delve into more personalization, you will have to buy Gems, which cost real money. Alternatively, if you buy a subscription, you will gain the ability to purchase gems with coins, thus creating a solid conversion. Upon reaching level 3, you will unlock the Drop System which gives you a random chance of receiving an egg, hatching potion, or food item when you complete tasks. These eggs, when hatched, can reveal a mount or pet to accompany you on your journey. Honestly, there are so many aspects to Habitica, including an entire social aspect, that you will learn it best by exploring it for yourself. By completing tasks and wandering about the app, you will discover a whole bunch of cool things to do. We hope that you have found a new favorite tool to help you stay focused on whatever you are doing, whether that be schoolwork, work work, or anything that requires careful attention. If you think that we left out a great app, share it with the community in the comments. Brain.fm is amazing music for focusing and just getting stuff done. I listen to it on Monday's or when its hard to focus and in 10 mins am straight into the zone. They have other music to help you do things, like relax and sleep I think. I tried the recharge station for 15 mins last week in the middle of the day and really felt like I had a mental nap. The others on this list are awesome and am going to try them out.